Larimar, found in only one square kilometer on the planet- a volcanic island in the Domican Republic- was thought to come from the ocean it resembles, rather than the volcano which produces it. Also called the Atlantis Stone, and the Dolphin Stone, a rare form of pectolite, is found in blues, white, and blue-green, only in this locale. The name, Larimar, is a combination of a little girl’s name, Larissa (the daughter of one of the discoverers), and “mar”, which means sea. It is renowned for its color, which mimics the sea and sky, and for its healing powers. Excavation of this stone is primitive, and is often halted by the monsoons that close down the islands for part of the year. Sources are limited. Mining is arduous. And the pieces are (gasp) beautiful! Everyone remembers the first time they ever saw Larimar. Novices, beware of fake Larimar. 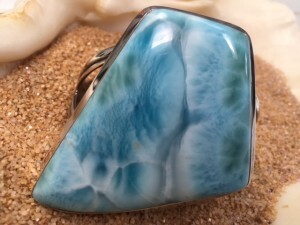 Once you have studied, even briefly, the beauty and mystery of true Larimar, the imposters will be obvious. If in doubt, ask.